This PDF 1.7 document has been generated by Microsoft® Word 2016, and has been sent on pdf-archive.com on 22/05/2017 at 11:18, from IP address 202.62.x.x. The current document download page has been viewed 270 times. File size: 169 KB (9 pages). delineated in these rule and regulations to preserve fair play and sportsmanship its sole discretion. following the commencement of the Supreme League Grand Opening Tournament. Player in connection with the Qualifier. 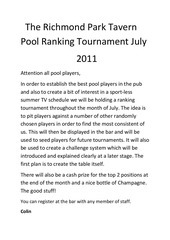 Prize money will be paid within 90 days of the Finals. Management agrees in writing) that Supreme League Management pay the Players directly. 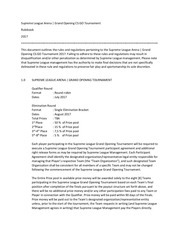 documentation has been completed and returned to Supreme League Management. coach/ reserve player (each a “Team”) playing in a single-elimination as further outlined below. described in Section 3.2 below (each a “Challenger Team”). its slot in the Qualifier. participating in the Qualifier or Main event in any capacity. 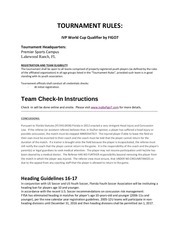 roster for the Qualifier will be permitted. as the “Challenger Teams” for the Main Event. as a Challenger Team to play against Recca Esports and Mercenaries. determined on the final standings of the Qualifier round. are from the same pool the winner of a coin flip will decide if they are either Team A or Team B.
rounds, another overtime will be played. next half. All time limits will be strictly enforced. Teams are not allowed to leave the stage without permission from tournament officials. the game will be beginning shortly and to be prepared to start. their character into sitting or standing on invisible map edges. not touching a solid object, or in a location where it is not making the normal “beeping” noise. 4.1.10 Players may not use objects to cover a bomb in such a way that it cannot be defused. 4.1.11 Players may not defuse a bomb through a solid object. mouse or keyboard during a game. competition. Coach rule is specified in 4.1.17. 4.1.15 Breaking one of the gameplay rules 4.1.6-4.1.14 may result in a forfeit of the game. the match nothing else is allowed. specified in 4.2.14 and 4.2.15.
from the beginning of the round. will not be restarted, the Team will forfeit the round. the game, the round must be completed. 4.1.22 The use of in-game changing scripts is strictly prohibited. 4.1.23 Only game-related chat is allowed during live gameplay. well as in their practice rooms. headset, Team communication software, and network equipment provided by Supreme League Official. proper function of the audio equipment prior to the start of all games. system. Use of the match medic system must be approved by the tournament director. League Official also reserves the right to inspect all equipment. on the January 6th 2017. Official -provided headset over their ears for the duration of all games. tournament computers without approval from a tournament official. Players may not use a USB flash drive or other storage devices. 4.2.10 Players may not alter game files or modify drivers. CS:GO client and any necessary drivers. result in a forfeit of the game. mouse, keyboard, or earbuds, but will not allow such issues to delay the tournament. for the week during Media Day. must remain in Player practice rooms at all times. upon notice from Valve. Any Tournament winnings by such player or such banned team will be forfeit. No player from a banned team will be eligible to compete in the Tournament with any other team. game. 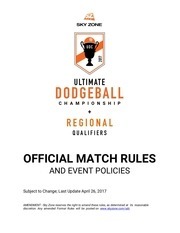 Players/Teams that are disqualified during a game must disconnect from the game. tournament. Such Players/Teams may also be subject to a ban from a future tournament(s). unapproved apparel as well as the right to disqualify a Player/Team for wearing unapproved apparel. do not have at least four (4) Players present by 15 minutes prior to the match’s scheduled start time. their referee’s permission, or is otherwise unable to play. 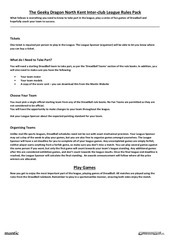 Language used in Team communication will be governed by the Supreme League Conduct Rules. leave the stage during halftime. Player picture provided by Supreme League or an approved Team and/or Team Organization logo. referees while being on stage, to be returned once they leave the stage. the stage at the time of a game. tournament. Same rules apply to hats or hoodies covering the headphones. Supreme League in each instance. promotion), and in connection therewith, Supreme League corporate partners and sponsors. Commercial Product/Service, without pre-approval from tournament officials in each instance. (e.g., tape over) any visible manufacture names/ logos on any Team/Player supplied equipment. 4.3.18 Supreme League Management has the final ruling on all tournament matters. This file has been shared by a user of PDF Archive. Document ID: 00600072.